Burnley Ladies claimed a place in the North West Women’s Regional League Cup semi-finals after edging past Fleetwood Town Wrens in extra time on Sunday. The Lady Clarets conceded in the first period of the game at Poolfoot Farm, and battled relentlessly to draw level, which they did late in the second period through Evie Priestley. The tie went to extra time, where two goals in the last 10 minutes from Sarah Greenhalgh sent them through. 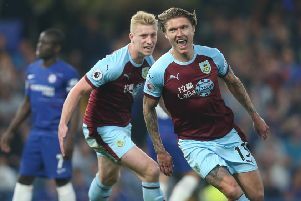 On a glorious sunny afternoon, with a strong and bitter wind blowing against the Lady Clarets, the first half was expected to be a test of their character. Fleetwood Town Wrens were determined to avenge two losses to the Clarets this season, and quickly demonstrated this through rapid closing and relentless challenges. On nine minutes, Justine Wallace fed a long ball through to Greenhalgh, who ran at the Fleetwood defence and unleashed a shot that was narrowly wide, and soon after, captain Jo Holt fed another long ball to Priestley, whose shot forced the keeper to get down to make a save. The keeper kicked upfield, and with a high bounce, the ball was over the Clarets defence, where home striker Danii Cross expertly took possession and beat Lauren Bracewell at her left post. Fleetwood enjoyed a period of pressure, but the Clarets responded, as Priestley had a header well saved and also hit the post. Clarets’ player of the match Lizzy Hamer shot from 20 yards but was slightly wide, and Greenhalgh also went close. Fleetwood were aggrieved when a penalty shout for handball was waved away, but in the last minutes of the half Greenhalgh played across goal to Lynette Craig, who shot wide with the Clarets’ best opportunity to equalise. In the second half, with the wind behind them, the Clarets were in the ascendency. Priestley was closest with a shot that deviated away from the top corner, and Leah Embley shot from over eight yards. The Clarets continued to up the tempo of the game, and their endeavours were finally rewarded in the last 15 minutes. Embley targeted Priestley with a pass, who quickly controlled the ball and shot, beating the keeper at her left-hand post to make it 1-1. The Clarets pushed on to try and find a winner, but the game went into extra time. The breakthrough finally came in the second period of extra time, with a Holly Hunter cross that was picked up by Greenhalgh, who cut through and shot wide of the keeper. Minutes later Greenhalgh was on hand to head home from new signing Phoebe Duckworth’s cross to clinch the game at 3-1. On Sunday, the Lady Clarets first team play league leaders Tranmere Rovers LFC at Barden Athletics ground, kick-off 2 p.m. The Lady Clarets reserves drew 3-3 with Penwortham Town Ladies at Nelson and Colne College, with two goals from Ami Phelan and one by Hannah Scott. On Sunday the Ladies Reserves are away to Academy Juniors Women, kick-off 2 p.m.